Have you ever seen someone wearing a shirt with a political candidate you don’t like, and automatically assumed the worst about him or her? Or perhaps you have been at a sporting event, and felt a strong connection towards fans cheering for your team. Why do we make judgments about people we know nothing about based on their group identification? Why do we assume good things about strangers who are more similar to us, or bad things about anyone who differs? What justifies this behavior? A dominant psychological theory that explains this behavior is known as in-group bias. Based mostly in social and cognitive psychology, in-group bias is the act of favoring one’s own group over other groups, where group membership is defined as an individual’s perceived identification with a social group’s qualities, goals or morals (Brewer, 1979). In this case, one’s own group is known as the in-group, and other groups are referred to as the out-groups. In-group biases are demonstrated at varying scales across the world. In-group bias can take the form of overall judgments of your own group in comparison to another group (for example: “we are so much smarter than them!”), or even be observed in the distributions of resources between small-scale or large-scale groups. In-group bias in this case could be observed in one country’s unwillingness to provide aid to another country experiencing famine. On a lesser scale, someone could exercise in-group biases about their own sports team compared to another sports team, or their own national identity versus another country’s national identity, which could manifest itself as nationalism or xenophobia. In-group bias goes hand in hand with out-group bias, which is defined as the act of holding specific ideas (most likely negative judgements) about a group that exists outside of your own identity group (Brewer, 1979). In-group bias has been demonstrated in psychological studies repeatedly. One of the most infamous studies was conducted at a boys’ summer camp by Sherif and his colleagues. In the study, boys were placed in isolated groups for over a week before being brought together again, as the researchers studied their intergroup relations. The results demonstrate that there was intense intergroup hostility, observed through behavior in competitive activities and overt intergroup behavior, where the boys exercised consistent favoritism of their own group over the opposing group. Sherif and his colleagues found that this hostility was only remedied when the groups were working towards collective goals that required intergroup cooperation (Sherif, Harvey, White, Hood, & Sherif, 1961). Sherif et al.’s work on in-group biases is important because it demonstrates the role of in-group and out-group salience in the strength of in-group bias, as seen through the lack of intergroup hostility present between the campers prior to their time in isolation from each other. Isolation appeared to increase in-group salience, which functioned to enhance perceived differences between the in-group and the opposing out-group. During isolation, the group bonds strengthened through the individuals’ increased identification with the group. As one’s in-group identity becomes stronger, the individual is more likely to hold biases about their own group and other groups. The salience of groups is affected by intergroup competition, differences in status and intergroup similarities (Brewer, 1979). For example, we seek groups to provide us with a sense of social identity which emphasizes that we belong within our social world. These groups provide us with pride and self-esteem. Therefore, we enhance the status of our own group in order to enhance our own identity statuses. We may make claims such as, “America is the greatest” or “the Patriots are the best team in the NFL”! As we increase our own group’s status, we oftentimes discriminate against out-groups as another way of enhancing our own self-image. Therefore, as we state that “the Patriots are the best team in the NFL”, we often also believe that the Green Bay Packers are the worst. 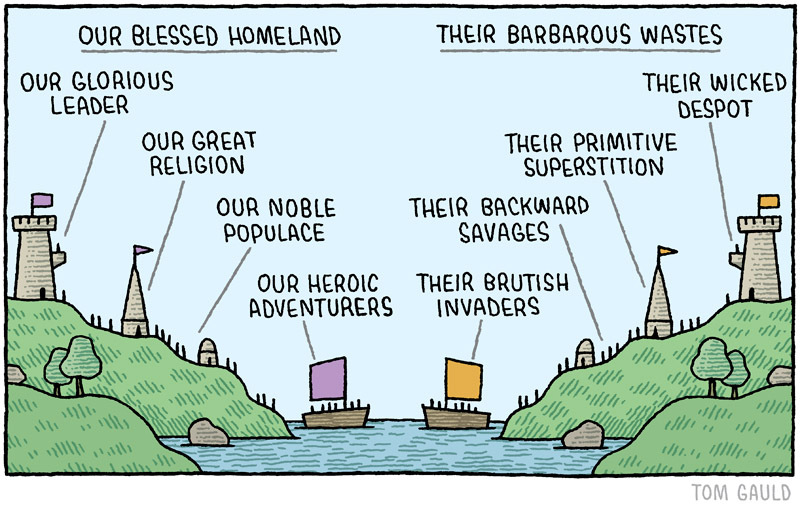 This process of social division between “us” and “them” is known as social categorization (Tajfel & Turner, 1979). Click here to explore Tajfel and Turner’s work on social identity in intergroup relations. Of course, social categorization goes beyond football teams, and has much greater impacts on society. For example, race as a social category has significant impacts on race relations, racial biases and racism as a whole. 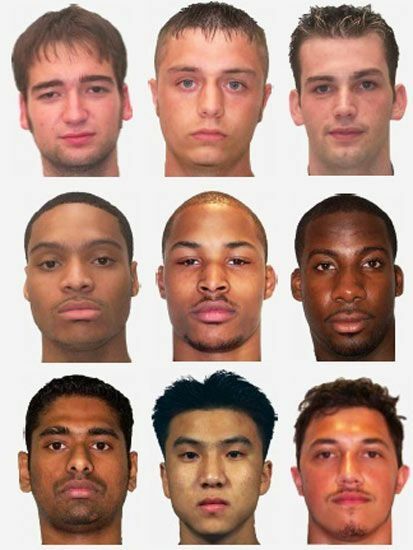 Research on the cognition of facial recognition for one’s own race versus other races states that people tend to process faces of the in-group, or one’s own race, holistically (Michel, Rossion, Han, Chung, & Caldara, 2006). Holistic processing of faces means that people take in large-scale patterns in faces, rather that recognizing faces by features such as noses or eyes. Holistic processing requires more skilled cognition, and may play a role in the ability to better differentiate between faces of one’s in-group race than out-group races (Michel et al., 2006). The ability to process faces of one’s in-group better than faces of an out-group may contribute to an individual’s perception of social divides between members of one’s own race compared to members of other races, as they are better able to see individuality within their own group yet manage to justify generalized ideas about other racial groups, as the individuality in face recognition is more difficult. Michel et al.’s study (2006) emphasizes that there are important consequences to holding in-group biases about other races. This can be observed when looking at the influence of in-group bias on the accuracy of eye-witness testimony involving suspects of different races, where suspects may wrongly accuse members of other races as guilty simply because they hold negative biases about the other race over their own due to perceived unfamiliarity. Click here to read more about Michel et al.’s study on cognitive processes surrounding in-group biases in facial recognition. Anyone who identifies with any collective identity outside of the individual self is susceptible to the effects of in-group bias. You can expect to experience in-group bias on a college campus, in the workplace, in a courtroom, in a sports stadium, or any other circumstance where an individual’s group identity is salient. Your experience of in-group bias may be as a member of the in-group or out-group. Regardless of your group identity, we all need to be cognizant of the social and cognitive forces of in-group bias as it shapes the way we relate to one another, both positively and negatively. Our mental representations, meaning an idea we hold in our mind about an external stimulus, of people based on their group identity are often unwarranted. It is important not to exercise biases about anyone who is similar or dissimilar to us based on their group identity. Brewer, M. B. (1979). In-group bias in the minimal intergroup situation: A cognitive-motivational analysis. Psychological bulletin, 86, 2, 307-324. Michel, C., Rossion, B., Han, J., Chung, C. S., & Caldara, R. (2006). Holistic processing is finely tuned for faces of one’s own race. Psychological Science, 17, 608-615. Sherif, M., Harvey, O. J., White, B. J., Hood, W. R., & Sherif, C. W. (1961). Intergroup conflict and cooperation: The Robbers Cave experiment. University Book Exchange, 10. Tajfel, H., & Turner, J. C. (1979). An integrative theory of intergroup conflict. The social psychology of intergroup relations, 33, 7-24. This is a very interesting and well-written piece, thanks for sharing! Your discussion brings up a lot of interesting ideas about the in-group bias, some which may certainly be applied to Colby’s campus. Many of us have adopted the idea that our school, campus, and student body are superior to others, yet many of us also greatly considered attending other schools before finally enrolling at Colby. How is it that we go from such a wide view about the high quality of many other schools to a firm belief that Colby is better than any other school? After reading your post, I believe that in-group bias is certainly an important mechanism in this phenomenon. I also think back to the 7 sins of memory, and the idea of persistence, which may also contribute to the in-group bias. Perhaps it is the persistence of positive memories with all of our respective groups such that it is hard to adapt and maintain memories of experiences with other groups. Persisting memories with groups that we belong to have been retrieved from long-term memory more often, which ultimately has increased our identity in the context of the “in-group.” This may all be pure speculation, but it would be an interesting idea to explore. Are Pictures Really Worth A Thousand Words? When It Comes to Memory They Are IKEA: Furniture Company or Masterful Manipulators?